The Rossignol Gala Snowboard is very inexpensive and very forgiving which is great for beginners. It might not have the dynamic feel underfoot that many riders that are more advanced want underfoot but it’s hard to get too picky at this price point. The Rossignol Gala is pretty much the old discontinued Temptation with a changed name and different sizing. Their mostly rocker hybrid camber and directional shape is a good board for people looking to ride the mountain more than the park. We say this with a caveat because the Gala’s setback changes according to size. With every size increase the Gala’s set back increases. So this is a freestyle to All Mountain ride. With every size increase the Gala’s set back increases. It actually starts with -10mm setback at 142 and then increases up to -20 for the 154. The bigger boards can ride set back and surfy while also being able to center the stance if you want to take a switch riding/freestyle approach to powder riding or when there is no powder. 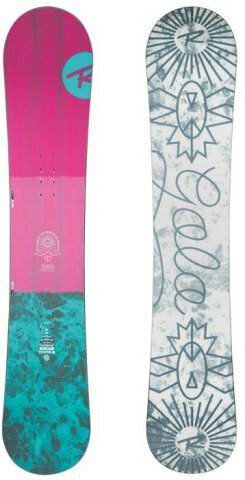 This is a stable fun groomer board and not a bad choice for anyone who wants to try everything but feels you most likely will end up riding the mountain. We aren’t the biggest fans of an extruded base but we cant hate too much. The drawback is they are slower but the good part is they are more sturdy and require less wax. Despite the extruded base the Gala aka still does a good job all over the mountain and offers the consistency you need when it comes to learning how to snowbard. This will help you stay out of the rental shop and get you to the next level. This is a very stable but catch free ride that can work for the rider that wan’ts to try a little of everything. We try to get as many images of the Rossignol Gala, but forgive us if they're not all there.